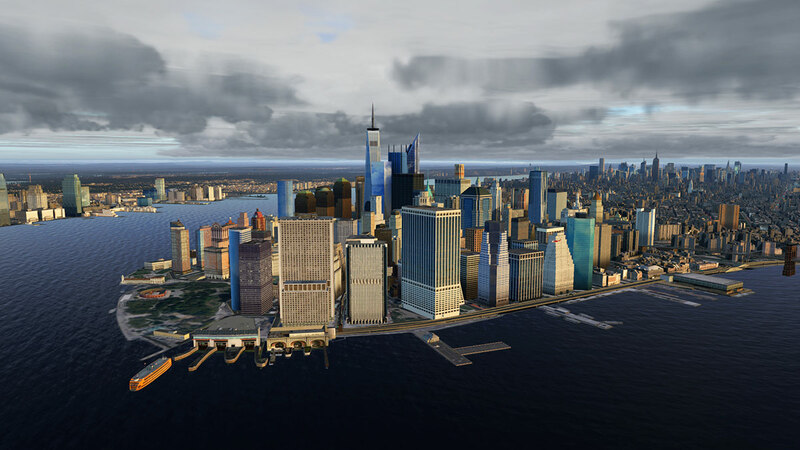 All sceneries are to current X-Plane11 standards (you have to update NYC XP if you have the original version) and are developed to interact with each other to create a full perspective of New York. First off with the three packages purchased (there is discounts if you already have the v1 versions) is quite significant at US$84.00, so yes you will expecting a lot of return for that kind of expenditure, but you can buy one or two and add in more later, but you would also expect a full package price as well for the three NYC packages purchased together. Before we even purchase any of the sceneries there is another big point to consider, and it is more relevant to the main New York City XP segment than the two airport packages. Framerate? 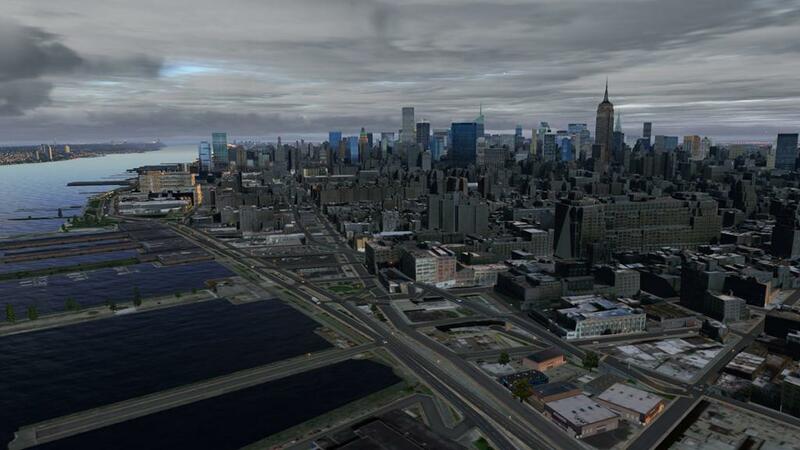 I ran for many years the Aerosoft New York X scenery converted to X-Plane, it was very good in detail, but the scenery had a huge and heavy pull on my framerate and then combined with FunnerFlight's KJFK it broke my computer's spirit to framerate hell and usually right down into the single digits. So mostly New York was off my regular routes, I just couldn't simply fly into JFK. So I approached these sceneries with a bit of trepidation. And another earlier issue was that earlier Drzewiecki Design airport (and city) sceneries had a bad pink tinge all around the sceneries edges that didn't look very authentic but that issue has been fixed here. 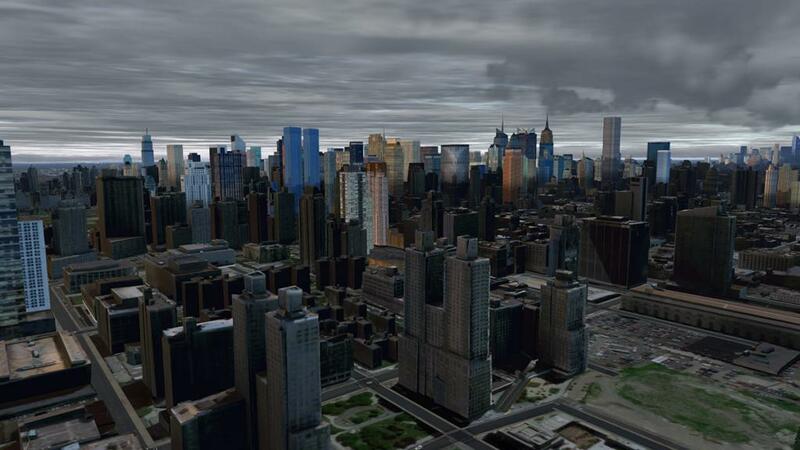 So here is the problem with large urban areas like New York, London, Los Angeles and so on. 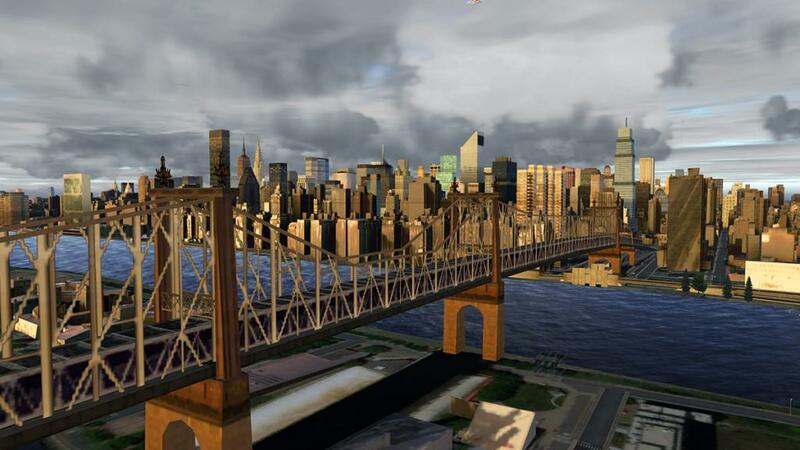 Great in the idea, but totally horrible in use and the ease of flying into and out of these iconic cities. Even if the custom scenery was very efficient then the huge native autogen downpull usually did you in anyway. Your only option is to dial your autogen back to barely nothing and leave huge swathes of blank areas in your viewpoint, or you just don't bother flying there... which really defeats the whole point. 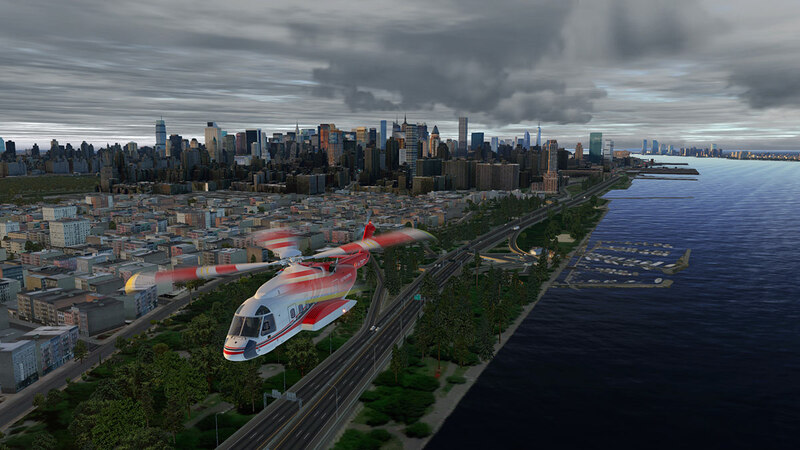 Thankfully autogen has got more efficient in X-Plane11 and computers are now faster and far more powerful, so these cities are now more of a possible and than in the past of being simply totally impossible to use. 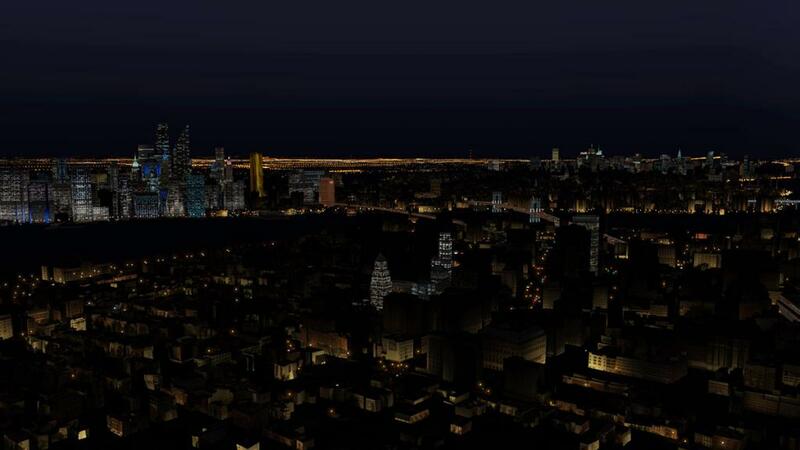 Which brings us to New York City XP. Sensing overload I set my X-Plane graphics "World Objects" slider to the more efficient Medium setting and my texture quality to my usual High setting. 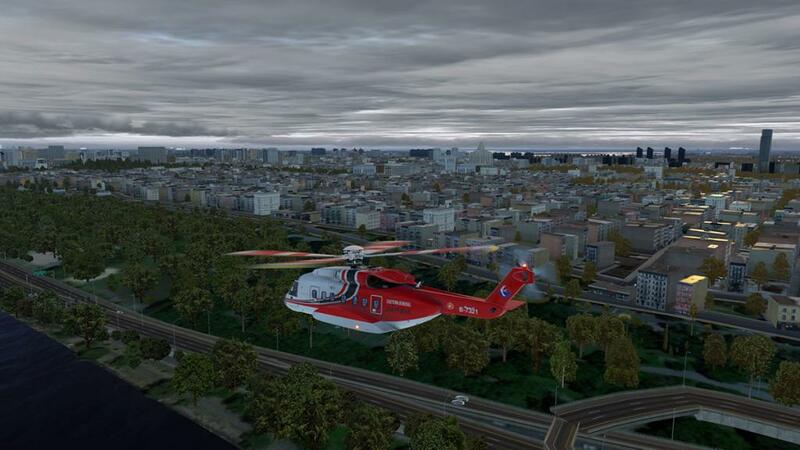 On running the scenery in X-Plane11 I then found the scenery wanting with too low an object count. 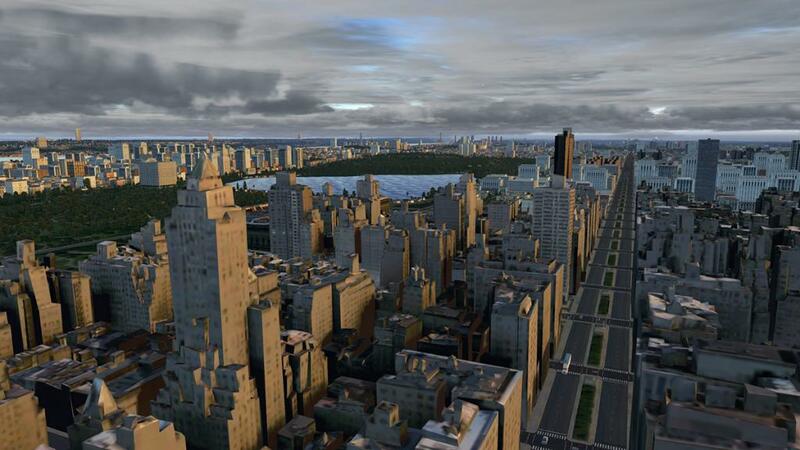 But the framerate was far better than I expected. So the point is to get the maximum benefit of this NYC XP then you will definitely need to be able to run the scenery with the "object" slider set to "Maximum" and that is asking a lot, but the texture quality is not as important unless you want absolute high detail. This Drzewiecki Design scenery is certainly highly efficient as at those above settings as my graphic card only hit 3341gb, so I doubt you are going to better that anywhere else, but you will still need a bit of power to cover the large autogen base required here and just one notch higher in the "maximum" texture setting wipes out my 8gb Graphic card at 8572gb. 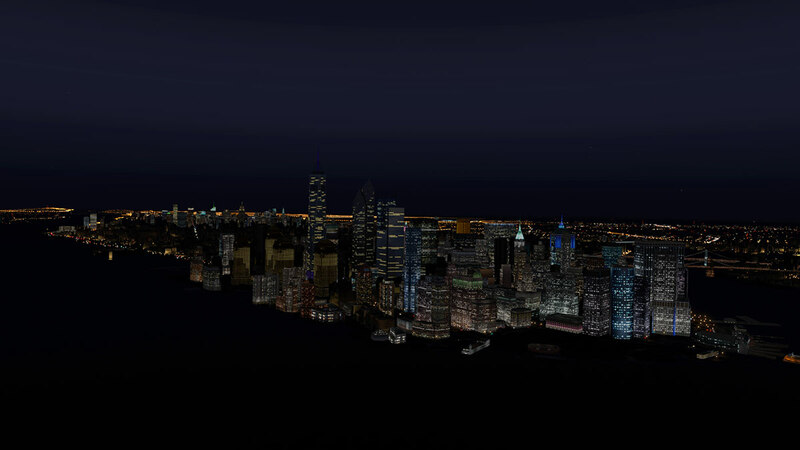 That said in my (medium texture) settings here I still achieved between 30fr to 24fr depending on the viewpoint and all the images in this review reflect those set settings, so NYC XP IS useable and flyable and so are all these NYC sceneries and for what you do get in visual terms is quite extraordinary for the sheer amount of objects on display here, but I will note that in processing this monumental amount of numbers I sometimes found a sight catchup shudder in viewpoints like out of the side of the cockpit or cabin windows, or if you pan the horizon with the autogen at its most complex. 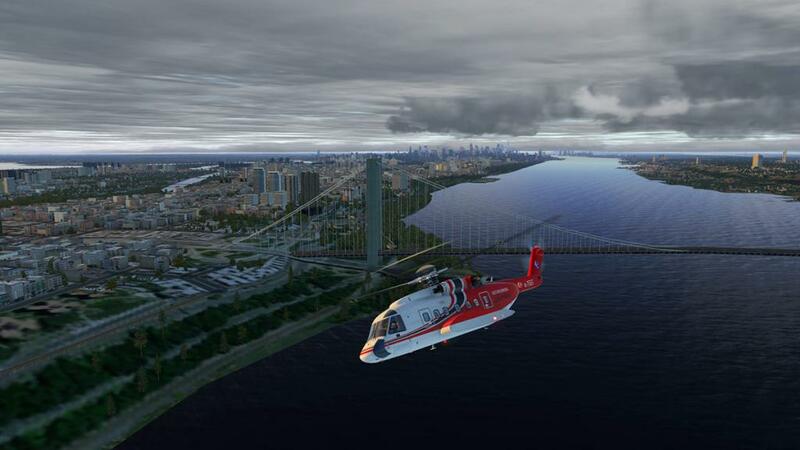 This is in reality the original release of the DD New York City XP scenery, but it has been upgraded to version v1.6 to intergrate with the updated airport sceneries and to use X-Plane11 effects, so even if you already have purchased the NYC XP scenery you will still and it is a good idea anyway to upgrade to the newer v1.6 version. To get a the full depth and aspect of the scenery I flew the S-92 Sikorsky by DMO right around the city in the important VFR reference, with departure from Newark and then first flying up the Hudson River to the George Washington Bridge and then looping over the rear of the city to come back down the Harlem/East River back to Battery Point, Manhattan. It is a very cold early New York morning and as I can't adjust xEnviro's engine for a more pleasant summer's day, so we will have work through the gloom and it is however very atmospheric in look, feel and very realistic. 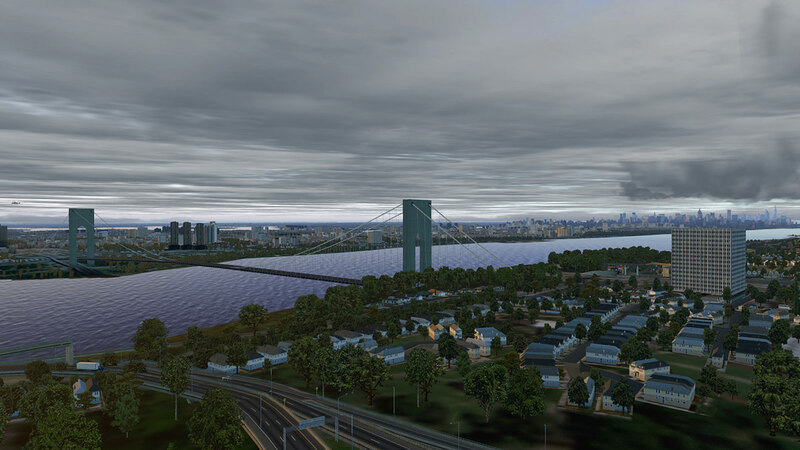 Departure from Newark - KEWR is misty, but a quick look over my shoulder and I can see the Verrazano-Narrows Bridge that has been modeled to separate the outer New York Lower Bay from the internal Upper Bay. There is a crucial point to make here. The whole New York area (Tri-State) has been completely covered with Photo-Terrain or Orthos (with the full set of packages). 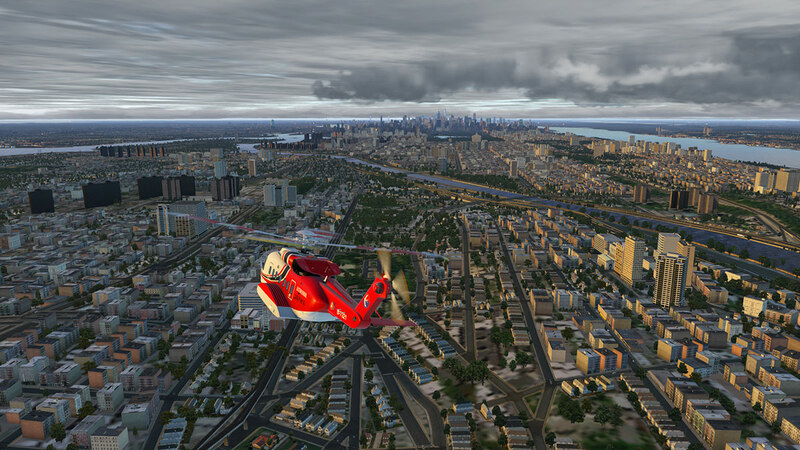 So they create an excellent VFR aspect when flying over the scenery. 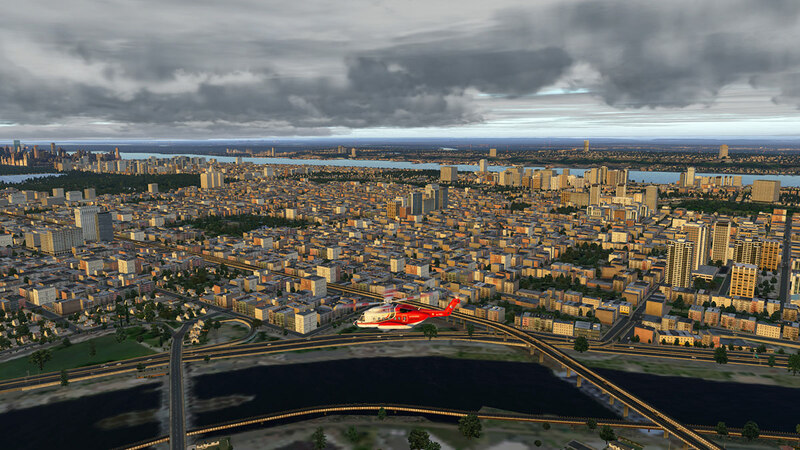 All the edges of the rivers and inlets and ferry terminals and can all be seen and easily recognised and the custom ortho is far, far more highly detailed than X-Plane's native mesh. 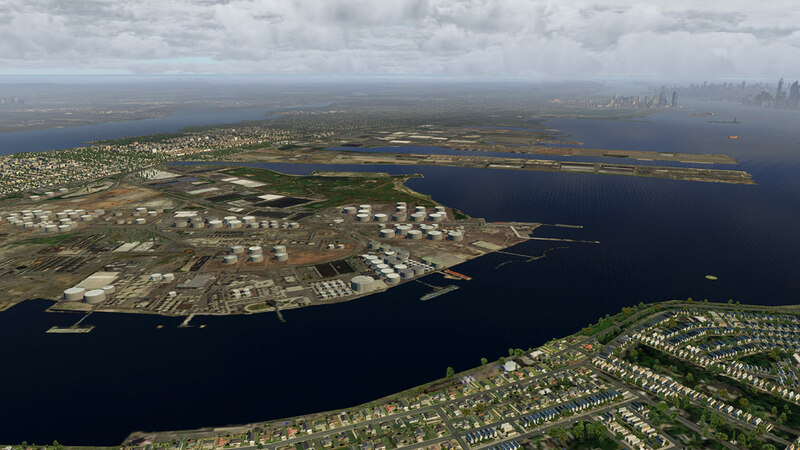 To highlight that point here is the Bayonne Energy Center and Fuel Terminal at Constable Hook, New Jersey with the Port Jersey Global Terminal in the background. They are not, detailed, detailed... but they do give you a perfect representation of the area and are excellent from the air, however a few New Jersey Port Cranes would have given the area a bit more realism. 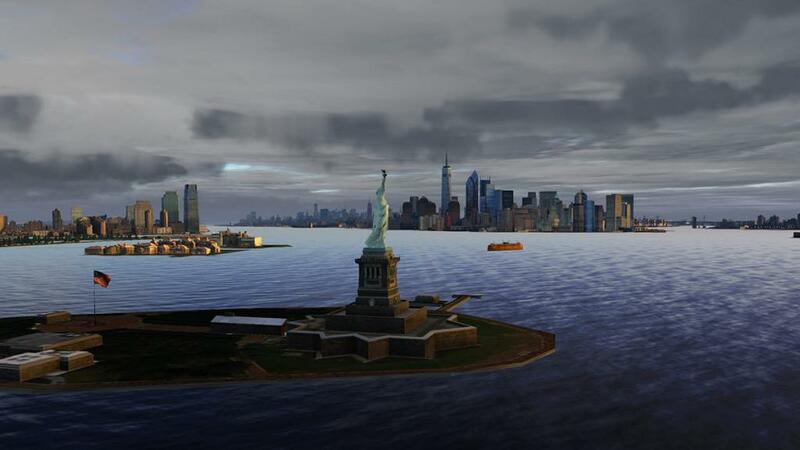 Upper, Upper Bay is of course the Statue of Liberty with Ellis Island set out behind the Statue. Detail up close of the Roman Goddess called Libertas is not extreme (my texture settings are set only to high) but you are not going to exactly walk up all the steps to the torch either. The view of Jersey City in the background is very well done, as most New York sceneries only deliver the Manhattan Island side, but the Jersey side is just as important to give the scenery its full scope. Past Libertas is the iconic Manhattan itself, The lower tip is Lower Manhattan, but that point is a misdemeanour really as the area has some of the largest and highest buildings in the city. 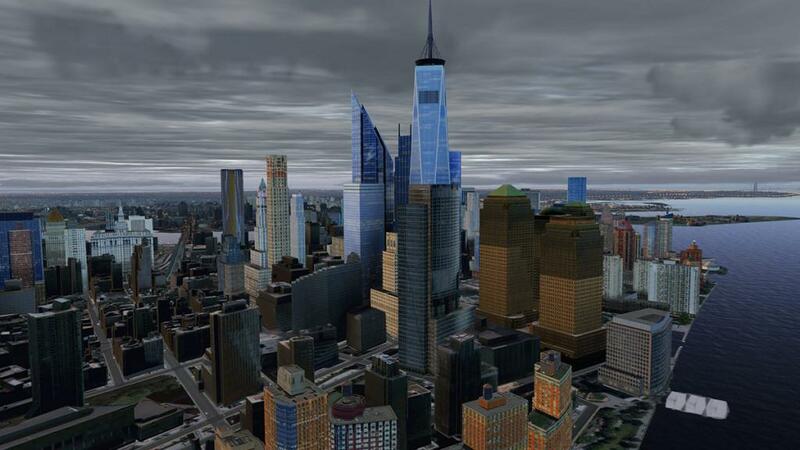 9/11 changed the tone and feel of Lower Manhattan, as the Twin Towers have now been replaced by the one "One World Trade Centre", and here in the scenery it is very prominent and well done, but the older buildings like the Woolworth's Building, One New York Plaza, Federal Reserve, Union Banks and City Hall are all noted. 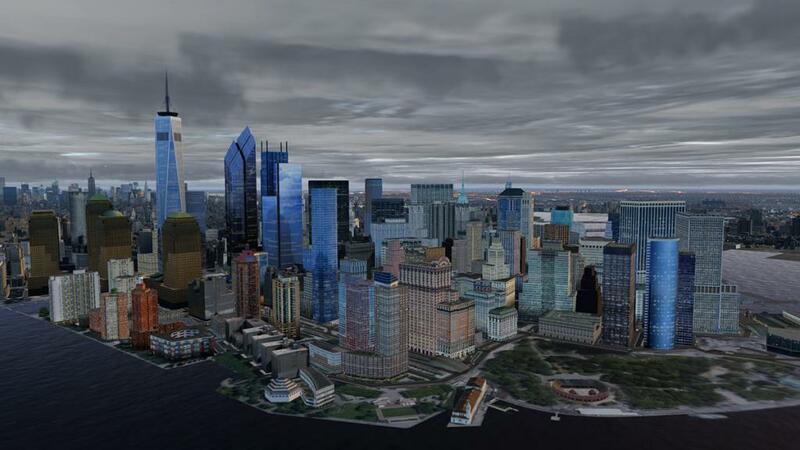 The World Trade Complex really dominates the Lower Manhattan area, with the surviving 4 World Trade centre and the newer 3 Trade Centre are also noted. The Twin Tower (Reflection) pools are there, but the new Fulton Street Complex is still visually under construction, Battery Park City is also represented ... 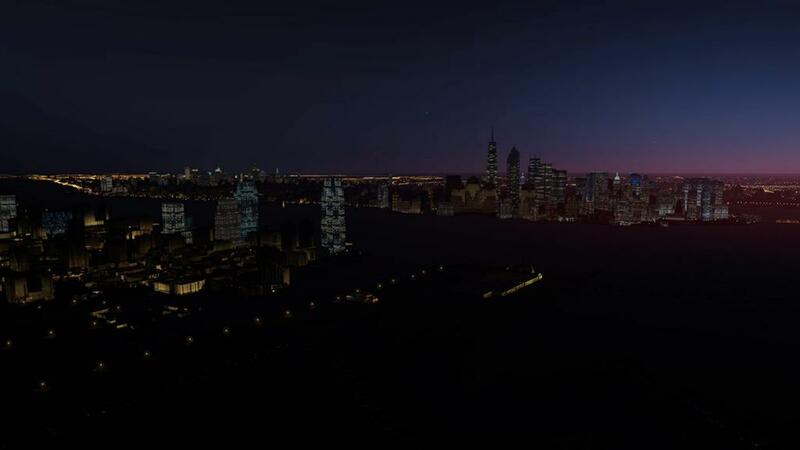 Overall it is a very good and accurate representation of the area, but to note that this is New York, and there are a few (okay a lot of) mega thin vertical cities under construction, ugly or not, this is the New York visual of the future. 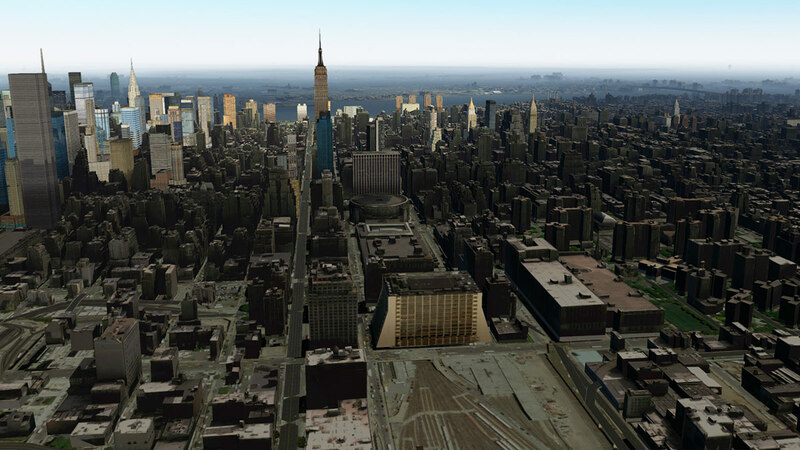 Once you pass Lower Manhattan you cover the relatively flat SoHo/Village areas. You are not going to get very detailed buildings and in fact look quite ugly up close, but they are the correct shapes and and totally create the correct vista of the area, it certainly feels and looks like New York. 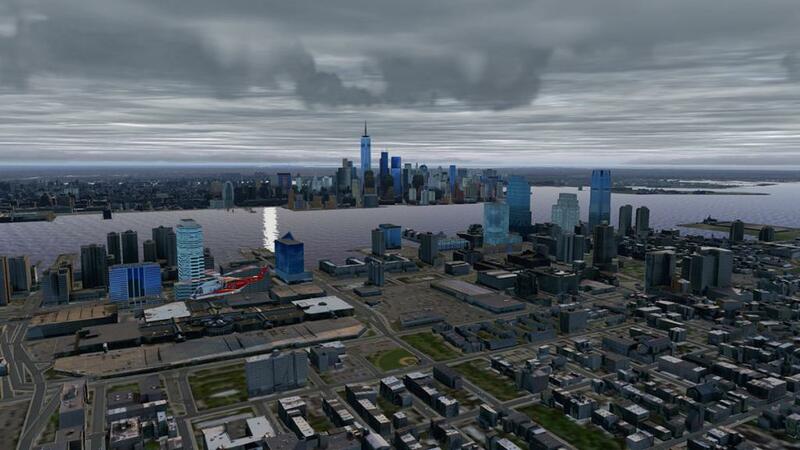 All the Hudson River wharf's are there including the Pier 25, Pier 40 Stadium, but a real disappointment was the missing Aircraft Carrier Intrepid Museum? That brings us to Mid-Town. 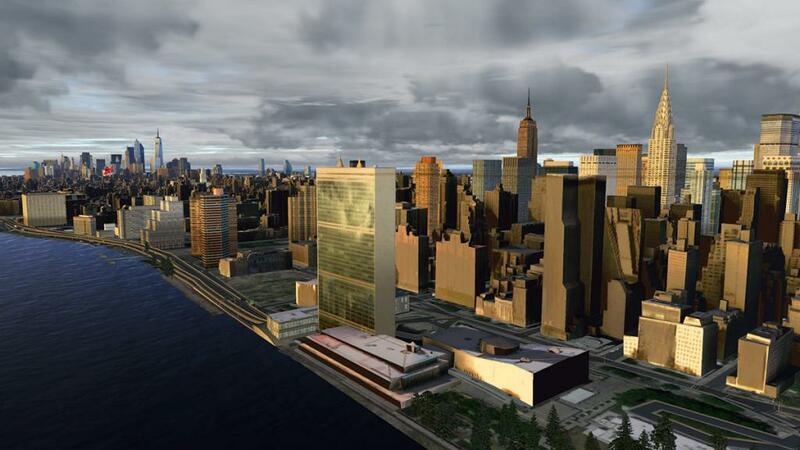 This is the core of New York and the city's heart. Front and centre is of course the "Empire State Building" and the iconic "Chrysler Building" is just a few blocks up and over. Prominent is the "MetLife" building at the top of (or the middle of) Park Avenue, but we still know it as the famous PanAm Building right! 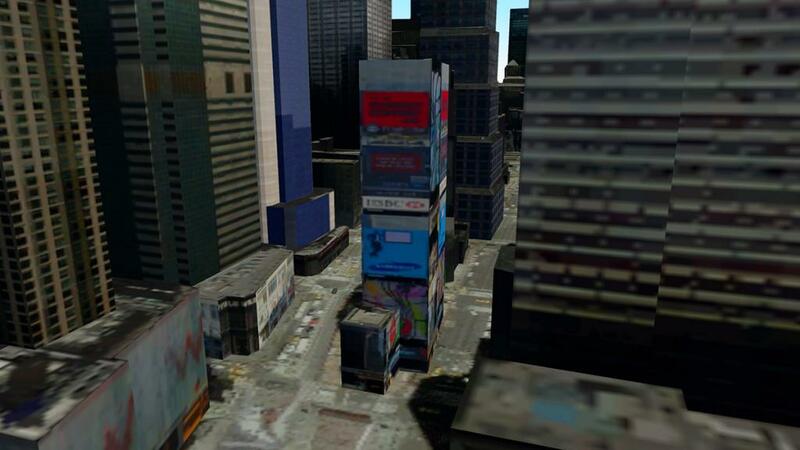 The huge "Madison Square Garden" complex is very well represented as is Times Square with its electronic billboards. 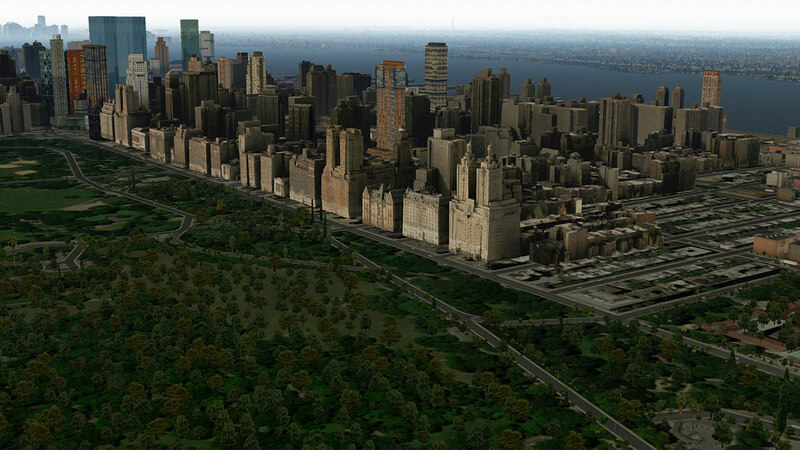 Past Mid-Town, Central Park then divides the city into the Upper West and East sides. 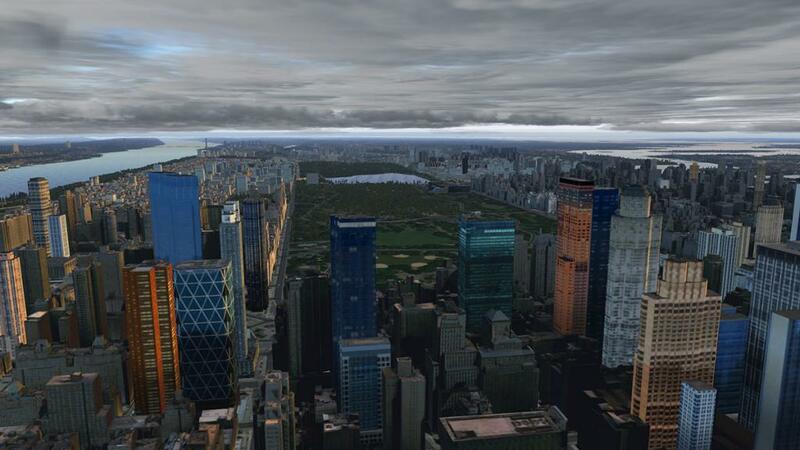 The Plaza Hotel is represented but the park itself relies on photo images and many 3d trees and objects, but from the overview visual aspect it does work fine, and it is in fact really good. The area along the famous Central Park side West is noted including the Majestic, Dakota and San Remo buildings but there is a large space were the Natural History Museum should be? 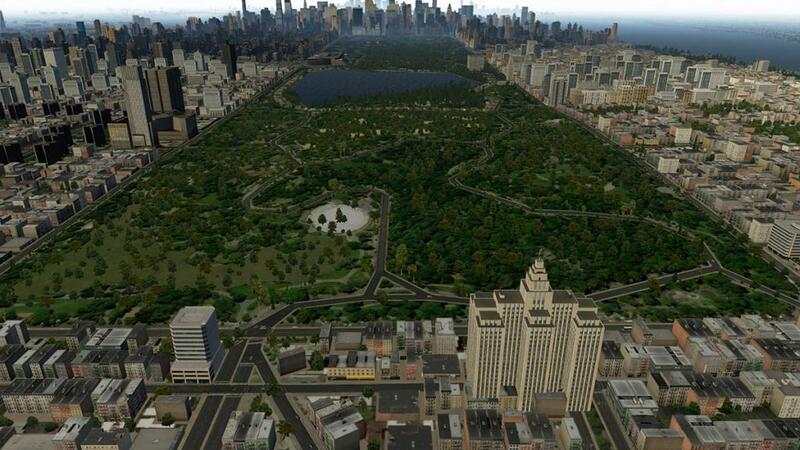 Once you clear Central Park the building density drops away to just urban sprawl as you move over Harlem. 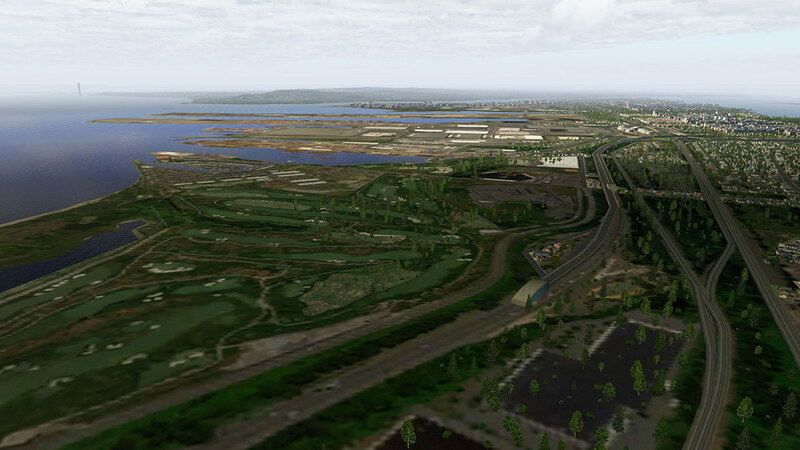 This is where the native autogen comes into its own, reduce your autogen and the area goes into plenty of blank spaces, run at the full "Max" (object) settings and the urban fill is very impressive. But up in Washington Heights there are still (some very nice) custom buildings to fill out the area. Looking back to Lower Manhattan from this far up the reach of the Hudson shows how very extensive the scenery is, as it covers in fact a huge area. 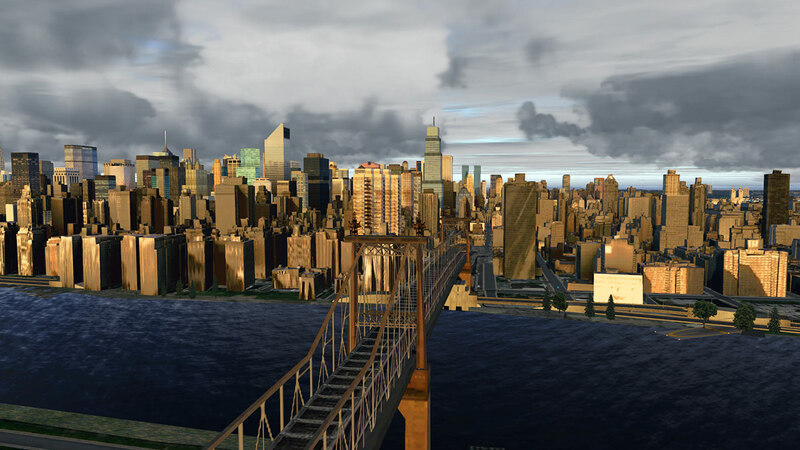 Washington Bridge is really the boundary of the custom scenery, but the autogen goes on far further to complete out the scene. 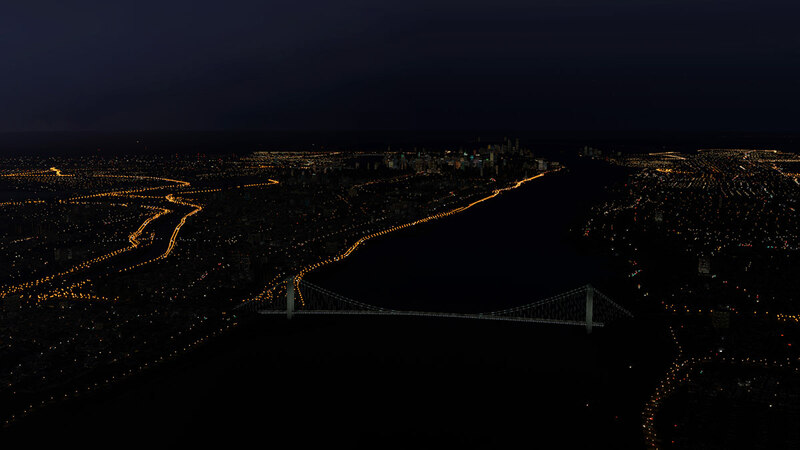 There are a few odd old approaches on the bridge and are noticeable, but thankfully situated below and not above the span, GW bridge itself is excellent and a good landmark when arriving in the area from the west. 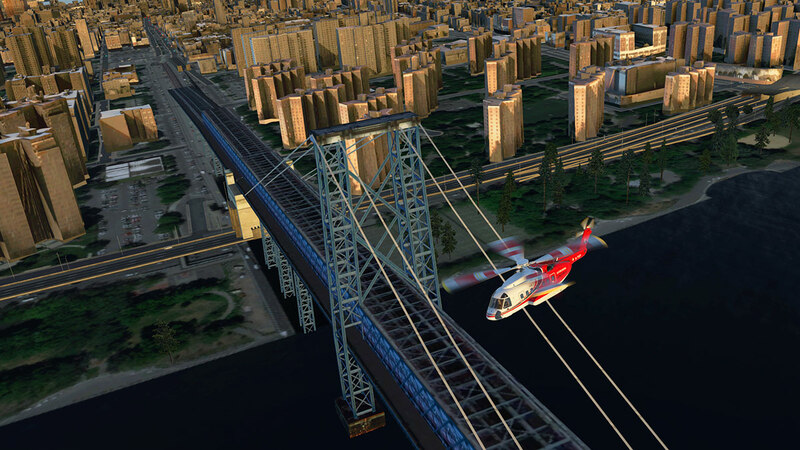 Cutting over the back of Manhattan the view is certainly very impressive, it has been a long time coming, but now X-Plane can finally have these sort of expansive sceneries to use. 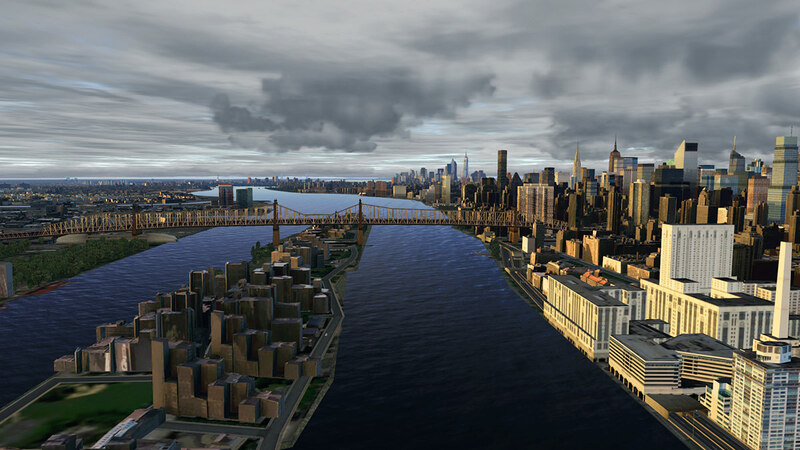 Over the Harlem River and into the East River and the area is dominated by blocks of tenement building, mostly bland in detail but still realistic. 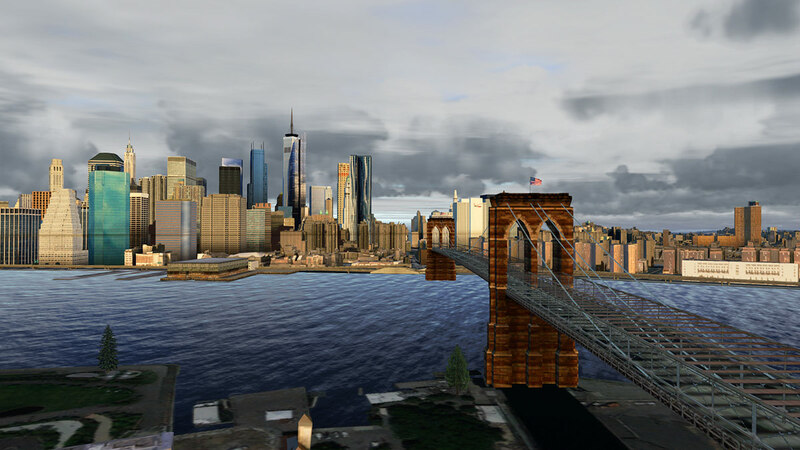 The twin bridges of the Manhattan Bridge and the most famous bridge in the city with the Brooklyn Bridge are next and both are very realistic, although the top walkway on or over the Brooklyn Bridge is not represented. 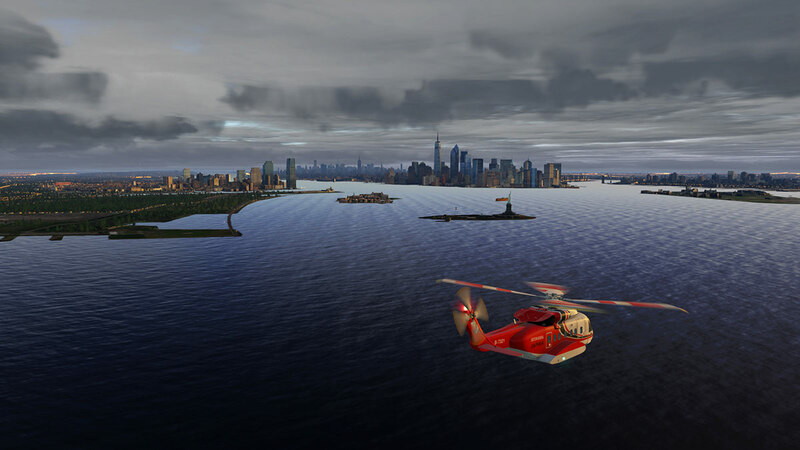 Reaching the Lower Manhattan area completes the Manhattan Island circuit and I will admit it was very impressive and very good for VFR flying. 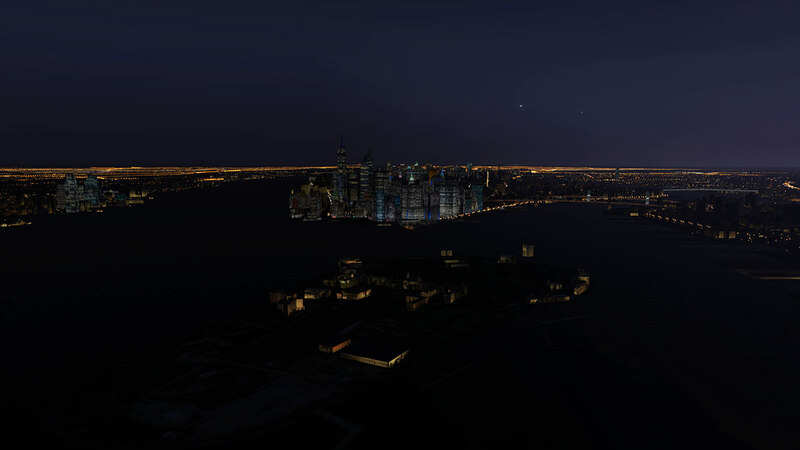 Again I flew out over Jersey City and to the west of Manhattan. 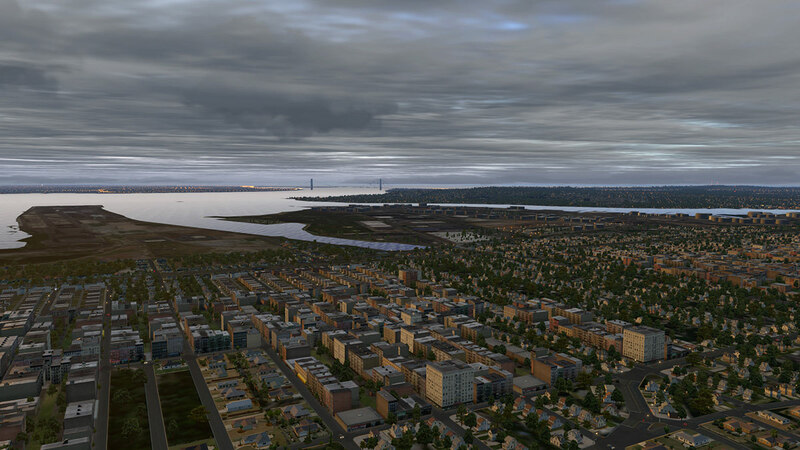 Moving over New Jersey confirmed the long reaches of the autogen that again filled out this huge urban landscape, as noted it is important that both the custom and the autogen do brilliant work together here, it is in reality a culminant of a dream of what the developers of X-Plane were aiming for. One aspect in custom can only do so much in filling in these huge city urban areas, but the added resource of the built-in autogen then delivers the rest, it all works here very, very well. 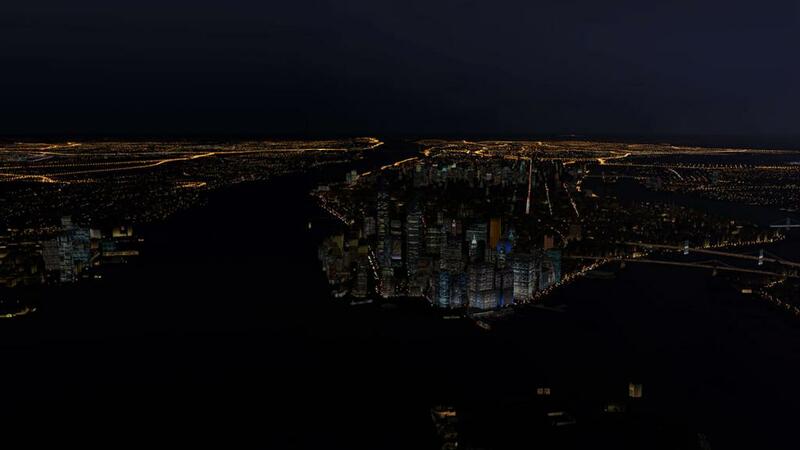 As you would guess in that the lighting of New York City is going to be no easy task... and that answer is a big yes and a slight no. 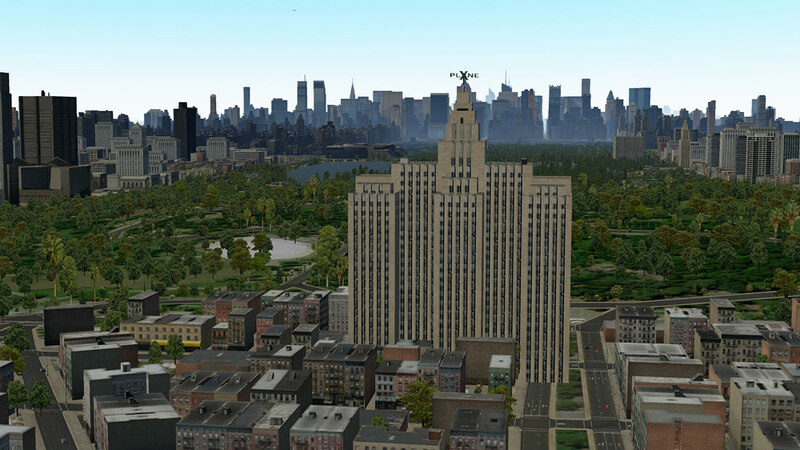 Thankfully the main Lower Manhattan and Mid-Town building lighting is very good, if excellent, but Drzewiecki Design are very good at this as noted in their Moscow scenery's office buildings, and at least it doesn't all look like that dreadful 2004 Flight Simulator block lighting, as I totally hate that look and terrible visual feel. So in the main it looks excellent at night. All the bridges are well lit and look spectacular close up and from a distance. 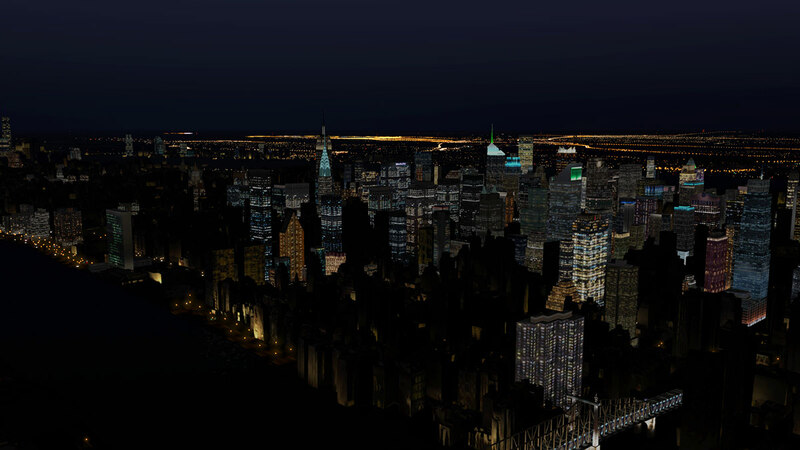 Mid-Town is like Lower Manhattan but the rest of the areas in between are quite dark, it passes the mark, but it could have been better in respect to these areas? 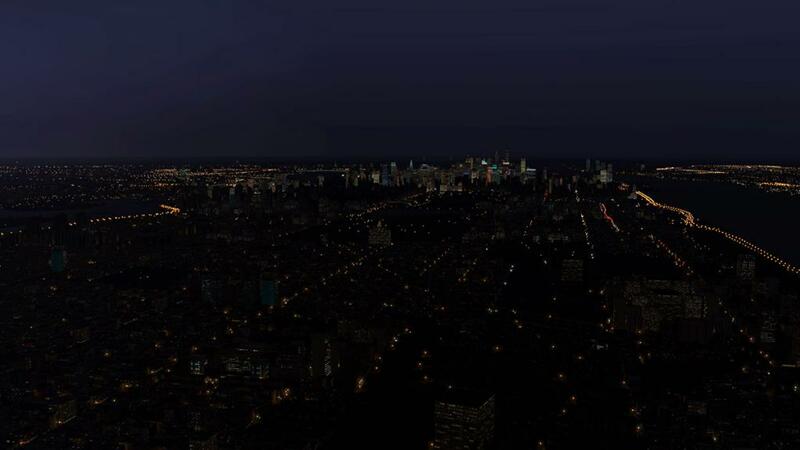 A little bit of help with the scenery comes with the expanded lighting feature in X-Plane 10.20, it does create a wall to wall urban nightscape that works very well here... overall you won't be disappointed on any arrival in New York City in the darker hours, in fact it is quite sensational. 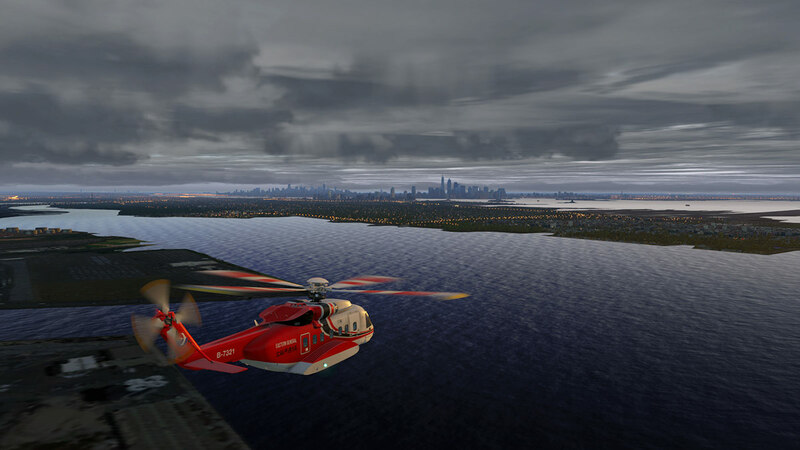 By getting to this point in the review you would now understand the sheer size and complexity of this scenery (and we haven't got to the six airports yet!). So there is a lot of visual aspect and detail in here. 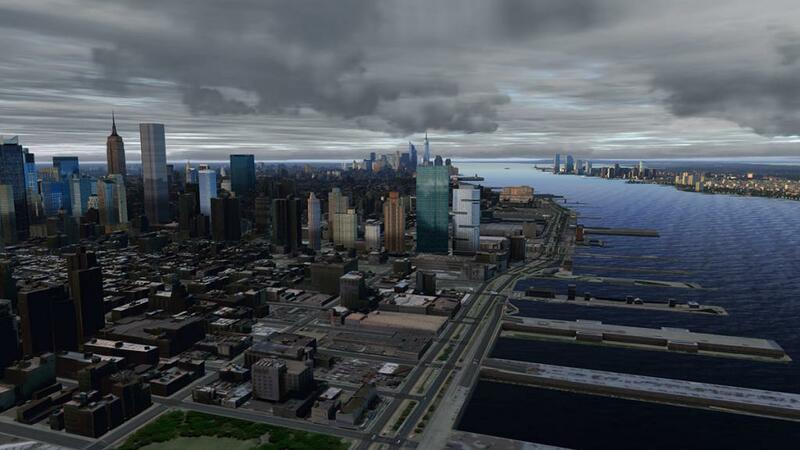 You will also now understand that why this scenery does require still a few compromises to run with at least some working headroom, unless you have some sort of computer that could run weather data. 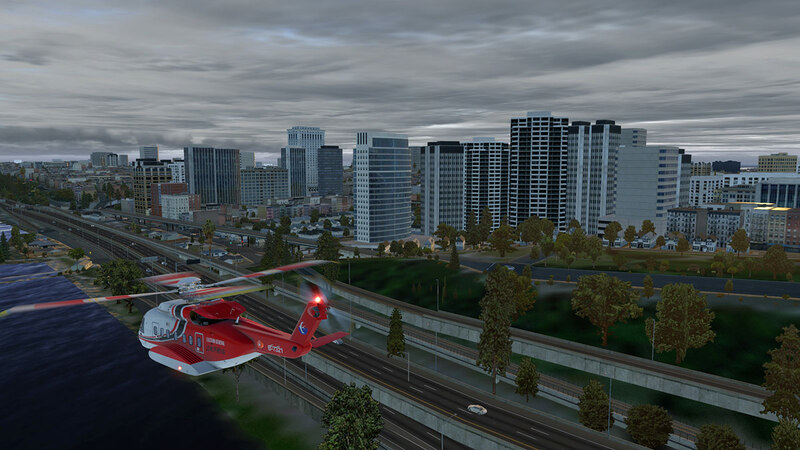 Overall we have to run this scenery so most of us can actually use it and that means the area to suffer here is texture quality, but as you can see in that yes some buildings are not at all detailed and just look like blurry blocks, but at least the view is good and in good lighting or weather conditions this issue is not a real problem as this scenery is really just about creating a visual viewpoint than a totally really detailed street by street reproduction of the city. The point to remember is that only a few years ago, city scenery like this was dream, and now like here it works, in another few years with say Vulcan and even more powerful processors then the full texture quality will also be achieved as well, but having the Object settings set at "Maximum" is crucial to making this scenery work together with the native autogen, if your computer can't achieve that setting and performance then you would be simply wasting your money. 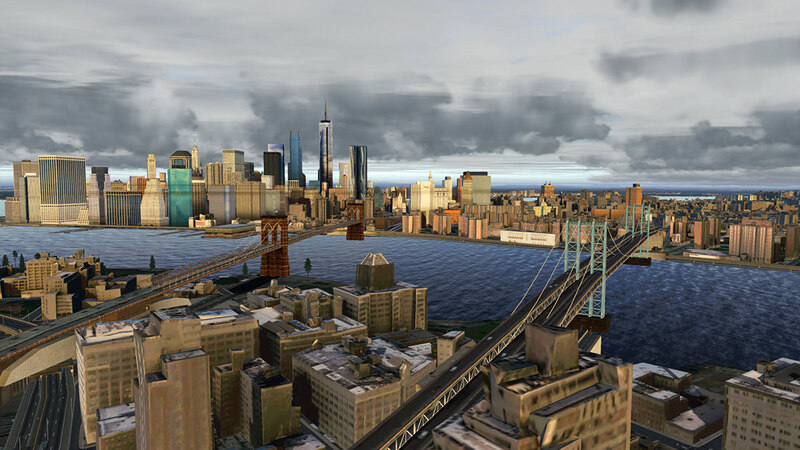 All the major New York icons and buildings are in this scenery and so are the important bridges as well including the important Verrazano-Narrows Bridge and Washington Bridge that notes the size and coverage of the scenery. 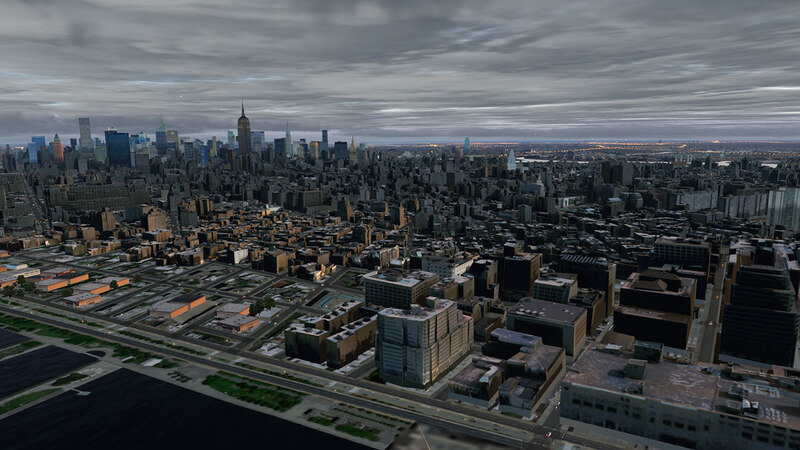 Pretty well every tenement building and high-rise building is noted in here and to the correct shape and height, but they are approximate in detail more than exact, but it all does give a very good representation of New York and its surrounding boroughs. There are a few things that were missing in here that would have been a nice to have. 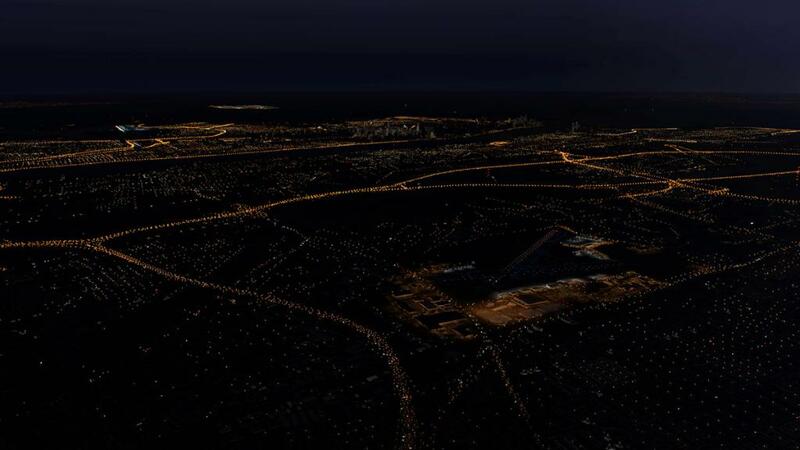 The New Jersey dockyard cranes are a really big surprise in their absence as they are very visible from virtually every approach to New York and especially as they are close to KEWR - Newark Liberty. The missing Natural History Museum on Central Park West is a "what the" moment in that it leaves a hole in the ground but also mostly breaks the areas line of tall buildings almost down to zero too early. 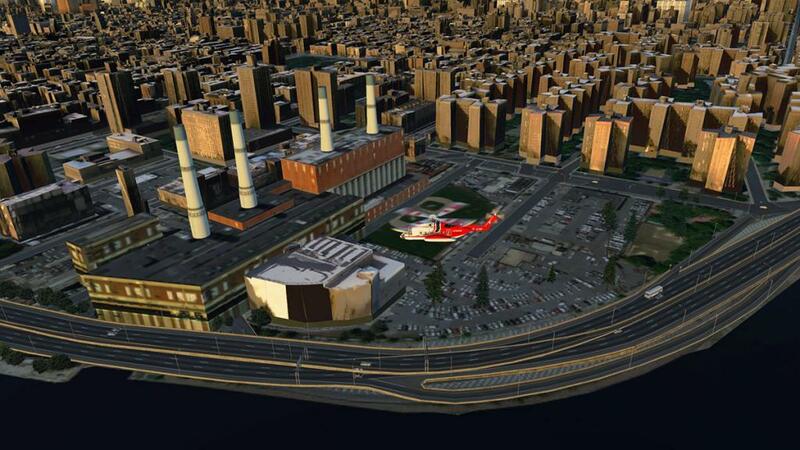 And the missing Intrepid aircraft carrier museum is another blank area that was an easy fix? and some ships at wharfs would have been a nice touch. 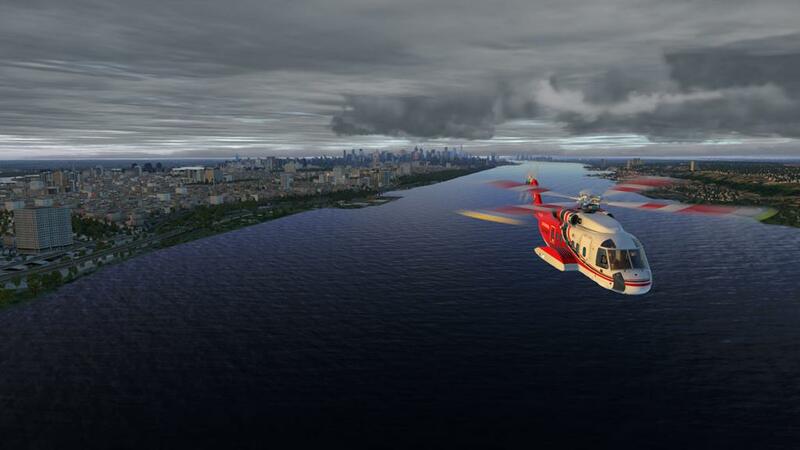 This review is part one of two reviews with the six airports in KJFK, KLGA, KTEB and KEWR - KCDW - KLDJ in the next edition. 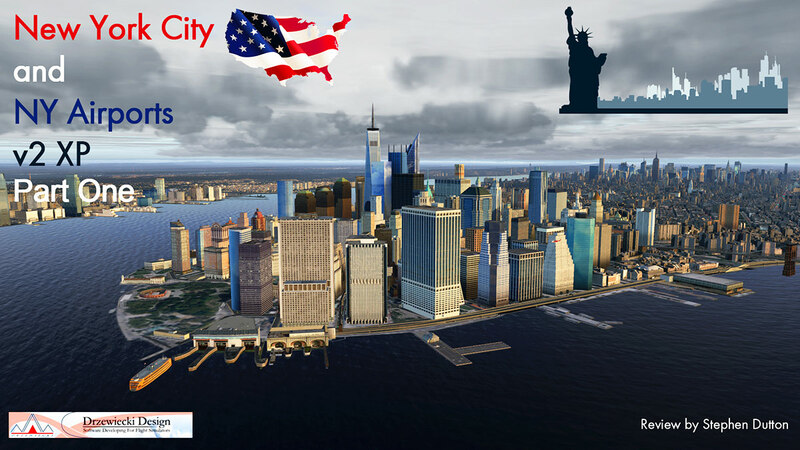 You don't have to purchase all the packages to enjoy this New York City scenery, but it certainly helps in getting the full aspect and the full use of the New Your area. So overall there are a few compromises, but this is a very efficient but outstanding visual scenery of New York City, and in reality it is the sort of scenery we dreamed of having in X-Plane only a few years ago... now it is here and it is all very, very good it is as well. Highly Recommended. 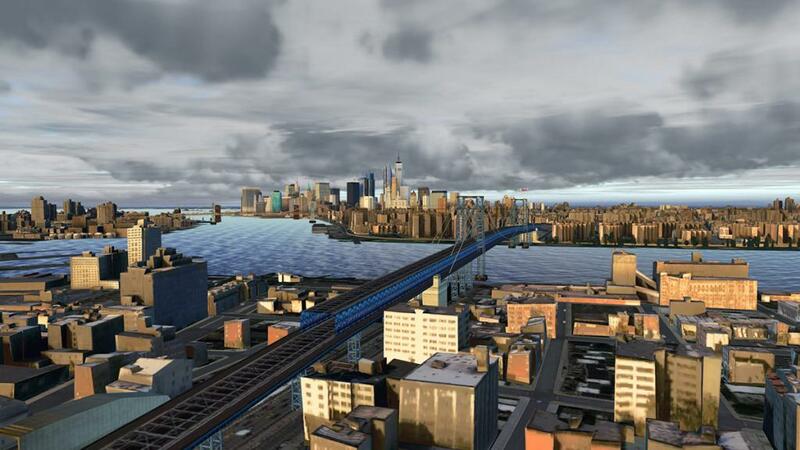 If using all three v2 packages together in 2 x Airport and NYC then the New York City XP needs to be the updated v1.6 scenery package version. Download scenery file size is 1.34gb. With the full installation installed package is 3.41gb in your custom scenery folder. 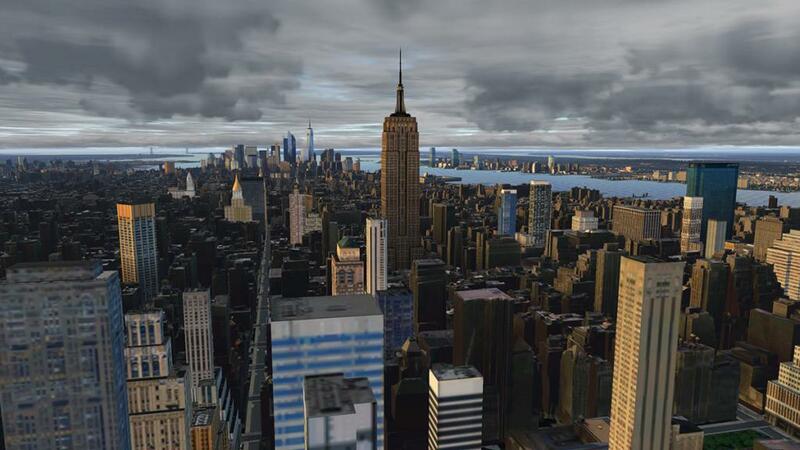 The New York City XP comes with an installer for Windows, but a manual install information .pdf is supplied. This requirement is mostly for the order of scenery folders with the added in airport packages, if only New York City XP it is only a one folder install. Both install and information manuals are included. 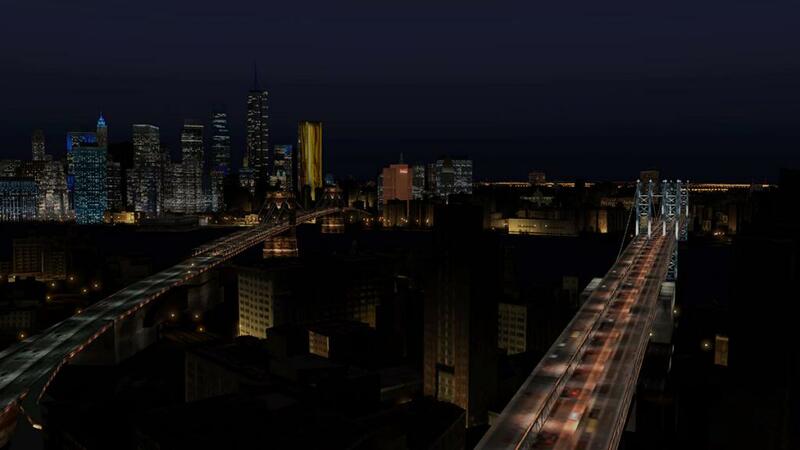 This has been one of my favorites since I bought it nearly a year ago and it is indeed a masterclass showcasing how well custom scenery and autogen should mesh together. 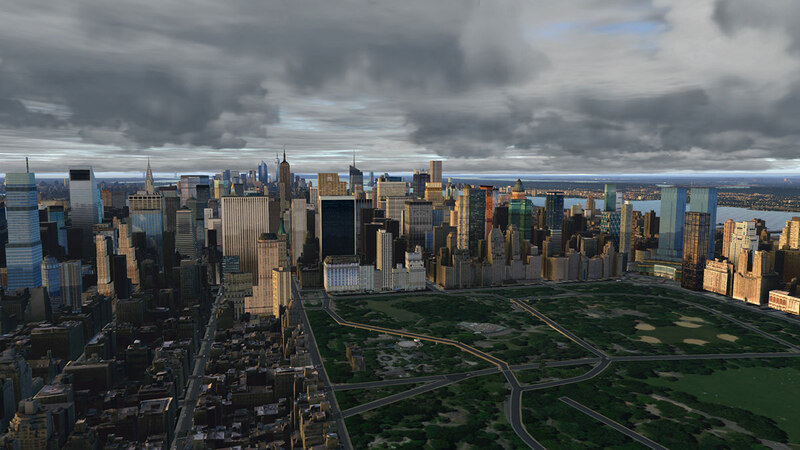 I really hope the availability of entire city areas continues to grow, as I'm getting more and more reluctant to lay down money for amazing airport scenery that is in the middle of nowhere scenery-wise.